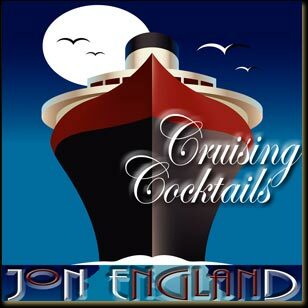 "Recorded while aboard the world's oceans on Cunard's legendary QEII Cruise Liner in 1995, Jon's magically-luxurious touch creates the perfect mood for those searching for the elusive "golden age" of the Cruise Line Cocktail Hour. From Hoagy Carmichael's "Star Dust" and "Skylark", through Jonny Mercer's "Autumn Leaves" and Eroll Garner's immortal "Misty" tribute, the distilled spirit of music's magical era is elegantly relived on the black and white keys of beautiful burl-walnut veneered 1920's Chappell 7' Grand Piano originally built for (and played) on the illustrious Queen Mary. As Jon's inimitable "Velvet Piano" touch wafts you from "Margarita" to "Gin Sling" - his richly detailed and sumptuosly arranged versions of 14 romantic "Cocktail Classics" take you to a place where satin-gowned bejewelled ladies and starch-fronted, tail-suited gentlemen carry on the serious business of utter indulgence while steaming aimlessly and languidly on the world's exciting and exotic oceans. Hugh Caswell, President; Azurre Records.